The Living Donor Transplant Team at the hospital have asked the boy's father for evidence of compliance from his parole officer for the next three months. YoutubeA.J. is two years old and is being denied a transplant based on his father’s parole status. 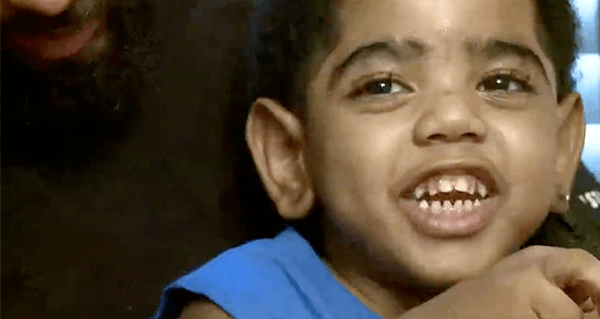 A Georgia toddler’s life-changing surgery has been put on hold, after the boy’s father — and kidney donor — was arrested for violating his parole. The two-year-old, A.J., was born without his kidneys. He requires constant medical care, and had a stroke two months ago, placing him at high risk for complications. However, he was given a chance at a new life when his father, Anthony Dickerson, turned out to be a 100 percent match. The surgery had already been scheduled to take place when Dickerson was arrested for violating his parole. He was charged with possession of a firearm. A.J.’s mother, Carmella Burgess, said that at first, the hospital was accommodating. She claimed that the hospital sent a letter to the Gwinnett County Jail, asking to let Dickerson continue with the surgery. However, Dickerson claims that once he was released, the hospital changed its tone. He said they sent another letter that postponed the surgery and asked to hear from his parole officer before rescheduling it. Now, the family has no choice but to get on the transplant wait list, despite the fact that the perfect match is within reach. They also have no idea how long it could take them to find another donor. Dickerson agrees with Carmella, adding that he doesn’t want his actions to affect his son. Next, read about this woman’s inspirational adjustment to a facial transplant surgery. Then, check out this theory that transplant hearts can transplant memories.